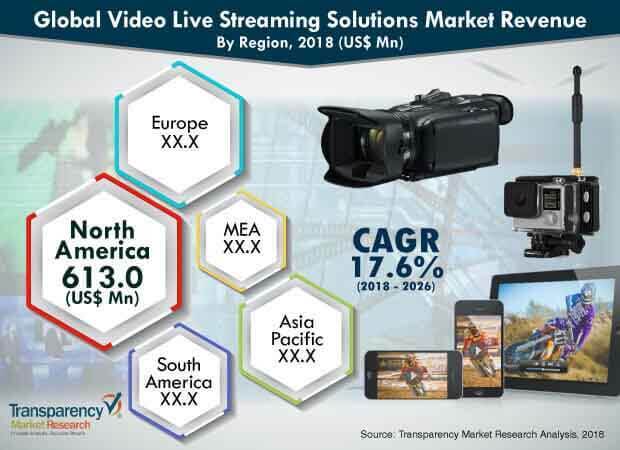 According to a new market report published by Transparency Market Research, the global video live streaming solutions market was valued at US$ 1,088.8 Mn in 2016 and is expected to expand at a CAGR of 17.6% from 2018 to 2026, reaching US$ 5,380.9 Mn by the end of the forecast period. According to the report, North America was the largest contributor in terms of revenue to the video live streaming solutions market in 2016. The global video live streaming solutions market is expected to witness considerable growth due to the increasing availability and supply of real time content. Viewers/internet users spend more time on digital video than on social media. YouTube no longer holds the monopoly on video influencers and creators. More and more live streaming solutions are appearing every day. Video live streaming solutions are gradually gaining popularity nowadays as people are giving more importance to online streaming services rather than traditional TV. The number of viewers is also increasing with the growing availability of real time content such as FIFA World Cup, Olympics, Academy Awards, and many more,. Thus, the rise in user demand as well as developments in networks would support this growth. Leading content providers are planning to provide new live streaming services to compete with other streaming solution leaders such as Wowza, Livestream, and Telestream. In addition, with advancements in broadband services, data access to stream live videos has been increasing greatly, enabling viewers to experience improved video quality without any lag in real time. The global market for video live streaming solutions has been segmented on the basis of component, software solutions, industry, and geography. Based on component, the market has been segmented into software and services. The software market is segmented into on-premise and cloud. Furthermore, the cloud segment is classified into public, private, and hybrid. The services segment is further classified into professional service and managed service. The services segment is anticipated to expand at the highest growth rate due to increasing demand for services such as consulting, integration, and maintenance. In terms of software solution, the market can be bifurcated into editing and transcoding, delivery and distribution, analytics, video security, publishing, captioning, and archiving. Editing and transcoding is anticipated to hold the largest market share during the forecast period. In terms of industry, the market has been divided into education; government; media and entertainment; gaming; retail; banking, financial services and insurance; healthcare; and others. The education sector is anticipated to expand at the highest growth rate during the forecast period. Live streaming services have become a vital component and almost indispensable in the domain of education. Children or adults with physical disability can also benefit from such an option. These live video streams can be viewed through laptops, smartphones, computers, or any other gadget. In addition, live educational video streaming can be used for various purposes such as educational, corporate training, and events. Geographically, the global video live streaming solutions market is segmented into North America, Asia Pacific, Europe, South America, and Middle East & Africa. North America is estimated to account for the largest market share in 2018 due to growing availability of live content and their adoption across the region. North America has a high penetration rate for video live streaming solutions due to its large subscriber base connected through multiple platforms. The market in Asia Pacific is expected to expand at the highest CAGR during the forecast period. This significant growth in this region is primarily due to the rising penetration of smartphones and the development of high-speed network systems across the region. Moreover in China, video live streaming solutions are gaining popularity with content ranging from amateur singers to celebrities sharing their daily life live. Major industry players in the video live streaming solutions market are adopting various strategic initiatives such as partnerships, mergers and acquisitions, and collaborations for technologies and new product development. The global video live streaming solutions market includes key players such as IBM Corporation, DigiVive Services Pvt. Ltd., Haivision, Inc., Qumu Corporation, Contus Support Interactive Pvt. Ltd., Sonic Foundry Inc., Telestream, LLC, Wowza Media Systems, LLC, Livestream LLC, and Ooyala, Inc.